It is high time now for the people of Sri Lanka to challenge the authority of the Tamil National Alliance (TNA), to act and speak on their behalf, on various matters be they political or otherwise. The International Community that includes the UN agencies, European Union, Commonwealth, UNHRC and such others too should come out openly to back the people’s demand, to stop the TNA from functioning further. During these thirteen years from 2004 the TNA was shrewd enough, in not missing a single chance, that came on their way, to strengthen themselves with the support of the International Community, which gave full support on the belief, that the TNA had been functioning in the best interest of the people. History is a country’s record of past events, Social Political and Economic, in order of time. Likewise the history of a country is the history of its great individuals. Therefore it is absolutely necessary to see that distorted facts are not introduced into the history of the country by ambitious and greedy persons for their personal gains. I have a sacred duty to protect the history of the Tamil United Liberation Front (TULF) which is obviously a part of the history of the Tamil people, founded by two great individuals Hon. G.G. Ponnambalam Q.C. and Hon. S.J.V. Chelvanayakam Q.C. They merged their political parties, the All Ceylon Tamil Congress (ACTC) and the Ilankai Tamil Arasu Kadchi (ITAK) also known as Federal Party, respectively, to form the Tamil United Front (TUF) on the 14 of May 1972 and subsequently changed it as Tamil United Liberation Front (TULF) at the next convention of the TULF, at which the President of the TULF Hon.S.J.V. Chelvanayakam got elected M/s G.G. Ponnambalam and Sowmiyamoorthy Thondaman, the leader of the Ceylon Workers Congress (CWC) to share the chair of the TULF with him. The very purpose of doing so was to prevent the revival of these two parties which both leaders wanted to remain merged forever. They had similar ideas with regard to the Ceylon Workers Congress (CWC) also on a future date. They left behind the TULF as their legacy for the Tamil people of Sri Lanka to look after all their interests. To strengthen and unite all, the TULF, on the advice of some leading Tamil citizens M/s V. Kailayapillai, Kandiah Neelakandan, V.R. Vadivetkarasan, Nirmalan Karthikeyan, S. Thiyagarajah and K. Jeyabalasingam, the TULF agreed to form an alliance with three other parties all of which were involved in an armed struggle, fighting for the liberation of the Tamils and agreed to contest on the TULF ticket with its symbol ‘Rising Sun’. The alliance partners, comprised of the TULF, ACTC, TELO and the EPRLF contested the General Election in 2001 at which, alliance won 15 seats. I have now found solace in an interesting article I could trace in one of the bundles of interesting articles collected by me during the last so many years. The article referred to is captioned “Tamil Parties cannot play coy in a corner”, authored by one of our most courageous and honest journalist, the late Mr. Dharmaratnam Sivaram, popularly known as Taraki, gunned down 12 years back. A local English daily carried it on 11th February 2004 with a photograph of mine supper imposed in a larger photograph of the late Hon. S.J.V. Chelvanayakam. If Taraki had not been killed at that time, several thousand innocent lives could have been saved, based on this article alone. He was the only one who had the courage to write in that tone, while several others were mercilessly condemning me and even ordained me as a “traitor”. There were some who even asked as to why I was being kept alive. It was Taraki, who was not my friend but only known to me, in his article had defended me, which I take as high complements paid to me and had also exonerated me of several unjustifiable accusations leveled against me, in a confused situation at that time, for which although belated, I wish to thank him not for anything else, but mainly for his courage. I hope that everyone, especially those who had been trading on his name and got many benefits including seats in Parliament, will drop their heads down in shame. The following, is an extract of the article referred to, clears a lot of doubts, some of which are still being used by some for their personal benefits. 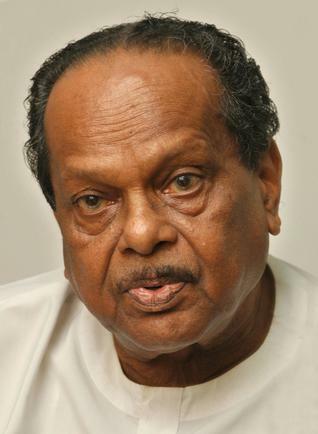 “The Tamil National Alliance has been made out to be more than what it actually is. If not for a variety of external pressures, it would have imploded at inception. Contrary to the chief myth about the TNA that it is managed by the Liberation Tigers – some of its leading politicians have had no scruples in running with the hare and hunting with the hound. They have no scruples in smartly exploiting the LTTE for their own political advantage. If you ask me, some of them wouldn’t even care two hoots for the struggles and aspirations of the Tamil people. If they do, then we would have seen images of Mr.M or Mr.S or Mr.V, fasting unto death in Tellipalai last week (their names are withheld to avoid any embarrassment). The attempt to portray TULF President Anandasangaree as the villain of the peace, is very wrong. At least the man speaks his mind. “Even the name ‘TNA’ was imposed on the quarrelsome bunch by the Tamil media, much to the chagrin of the TULF and the ACTC, which preferred to call it the ‘Alliance of Tamil Political Parties’. The dominant image of the TNA as the political paw of the Tiger is deceptive”. All those who read these will agree at-least now, that all what was said about the TNA, the myth that the TNA was managed by the LTTE, that the TNA as the political paw of the LTTE, and that the TNA was formed by the LTTE were not true and highly exaggerated. Some leading politicians were running with the hare and hunting with the hound and exploiting the LTTE for their own political advantage were all very true. According to Taraki the “Several interest groups in the northeast, particularly the Thamilar Marumalarchchi Kalaham in Batticaloa, began a campaign for Tamil political unity as soon as dates for the December 2001 general elections were announced, and that these lobbies felt that all Tamil parties and groups in the northeast should be brought under one Tamil national umbrella regardless of their deep divisions and regardless of their long association with the military and allegations of rights abuses”, clearly show that the initial moves were taken by the TULF to start an alliance was, modified by Taraki and many other organizations interested in the unity of the Tamil people. 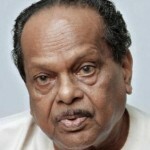 In reference to an unidentified TULF stalwart Taraki had said “When the matter was discussed with a Tamil United Liberation Front stalwart who used to persistently claim during the war years that he had close links with the LTTE, he strongly objected to the TELO and the EPRLF joining the proposed alliance. He simply dismissed the matter, claiming that the Tigers were completely opposed to the two groups contesting the elections under the Tamil national umbrella. 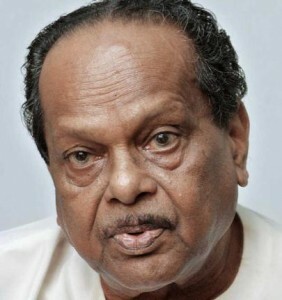 Also, at that time this TULF politician was in the habit of saying that he was constantly in touch with the LTTE’s political advisor, Mr. Anton Balasingham. However, it transpired later the TULF politician was lying”. Taraki had refuted the claim of the said TULF stalwart that, “Karikalan, a senior Tiger leader in the east, told a delegation of the Thamilar Marumalarchchi Kalaham in Batticaloa that the LTTE had no objection at all to the TELO and the EPRLF joining the alliance but was very keen that the two groups should be brought under the Tamil National umbrella as soon as possible. He was also eager that POLTE too should join the TNA. This was at a time when PLOTE, EPRLF and TELO were officially working with the Sri Lanka army in intelligence and counter insurgency operations in the northeast”. 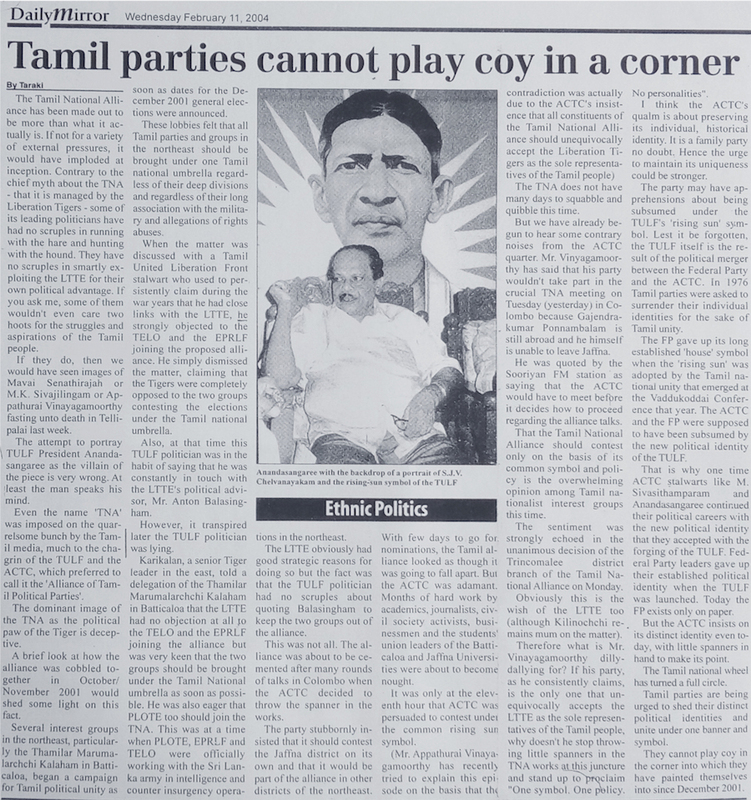 Taraki further writes about the LTTE’s strategic reasons, Balasingam’s request regarding two organizations, how after several rounds of talks in Colombo, the alliance was about to be cemented, the ACTC decided to throw the spanner in the works, how the ACTC insisted in contesting the Jaffna district on its own and that it would be part of the alliance in the other districts, how with only a few days left for nomination the TNA looked as though it was going to fall apart and how months of hard work by many organizations was about to become nought. Referring to the ACTC Taraki said, “It wants to preserve its individual historic identity and maintain its uniqueness, stronger and also that the party may have apprehensions about being subsumed under the TULF’s ‘Rising Sun’ symbol. The TULF itself is the result of the Political merger between the FP and ACTC. In 1976 Tamil parties were asked to surrender their individual identities for the sake of Tamil unity. The FP gave up its long established ‘house’ symbol when the ‘rising sun’ was adopted by the Tamil national unity that emerged at the Vaddukoddai Conference that year. The ACTC and the FP were supposed to have been subsumed by the new political identity of the TULF. That is why one time ACTC stalwarts like M. Sivasithamparam and Anandasangaree continued their political careers with the new political identity that they accepted with the forging of the TULF. Federal Party leaders gave up their established political identity when the TULF was launched. Today the FP exists only on paper”. It was only at the eleventh hour that ACTC was persuaded to contest under the common rising sun symbol and also that the Tamil National Alliance should contest only on the basis of its common symbol and policy is the overwhelming opinion among Tamil nationalist interest groups this time. The sentiment was strongly echoed in the unanimous decision of the Trincomalee district branch of the Tamil National Alliance on Monday. Obviously this is the wish of the LTTE too (although Kilinochchi remains mum on the matter). A close study of Taraki’s article clearly reveals how foolishly the TNA leaders had handled the ethnic issue which is the main stumbling block for the progress of the country. We had several opportunities that came on our way, all of which failed on flimsy grounds. A very rare and a good opportunity was made available to us to reach a solution in 2004. Whether we succeeded in it or not is a different matter but the question is whether we tried it honestly. Taraki did not announce with pleasure, to all those who had worked hard to find a solution for the ethnic problem that, “Kilinochchi alone kept mum”. No one can deny that “Kilinochchi keeping mum”, ultimately brought destruction to the LTTE, thousands of innocent lives lost and many such other pathetic and tragic incidents had taken place. Taraki’s ultimate plea to all is that “All Tamil parties must give up their identities and get united under one banner and on one policy”. I hope those who maintained mum in Kilinochchi will at least now open their mouths and speak out. Anandasangaree purports to speak for the international community when he has no mandate from any community. Ananda Sangaree may have been rejected by the Tamil community at the hustings over and over again, to the delight of his opponents and detractors,but how has that improved or in any way bettered or at least improved the quality of life of the displaced people of Mullivaikal or even Killinochchi his former constituency? True, he has lost everything, but barks at people when he feels like to bark at someone. He is like an old dog, has nothing important to do. He has screwed the TULF party’s image and allowed the people to go behind the TNA. In 1970’s and 1980’s the TULF was a big political party. What can I comment, what to comment on and how to comment. I have no words to comment on Mr.Sangaree’s article except to say that the Tamil political leaders are and were more interested in party formation, party name and its leadership as if they own it, all in the name of the Tamil people. This Photo which Anandasangagaree has displayed along with his essay only proves one thing; Political Prostitution using the name of SJV Chelvanayagam! Anandasangaree knows that at the August 2015 elections TNA got a very large slice of votes electorate-wise and overall. Ananadasangaree has not mentioned this anywhere. He says “It is high time now for the people of Sri Lanka to challenge the authority of the Tamil National Alliance (TNA), to act and speak on their behalf, on various matters be they political or otherwise”. This is a meaningless red herring. Surely Anandasangaree must know a thing or two about the Lankan system of elections. It is not perfect but it keeps him out. This is sad when everyone other than an individual realizes that their time has past by without them realizing. Just retire from politics if you have any dignity left. Surprise … Surprise…TNA claimed to have a direct line to Pira’s Bunker, while the Vellalas lead by Sampathar and the kid Abraham, lived in leafy suburbs of the Harbour City….What then is this BS about Sampathar was afraid that Pira would kill him ……And didn’t offer condolences to even the current intended Federal Partners, when their young men, 300 of them got chopped in Kaththakaddy., let alone saying sorry to poor Sinhala Dalits who lost thousands of their loved ones to marauding Pira’s Tigers……No wonder Sampathar’s mate Sivajilingam now wants to take the 12,000 well trained Tiger Cadres under him….. And chase the Army , Navy and the Air force out of the North , lock , stock and barrel……..While Sampathar is helping UNP Dr Ranil to draft the Federal Thing behind closed doors. and keep poor Sagaree out…….May be Sagaree should join Thonda Party and help the Dalits get something out of Dr Ranil’s Federal thing………..